Graduated as a veterinary surgeon in 1976 at the University of Liverpool, then obtained an MSc in Aquatic Veterinary Studies from the University of Stirling. He became an FRCVS in 1996 and is uniquely recognised by the Royal College of Veterinary Surgeons as a Specialist in both 'Zoo & Wildlife Medicine', and in 'Fish Health & Production'. He has worked extensively with fish and 'exotic' species for 30 years. 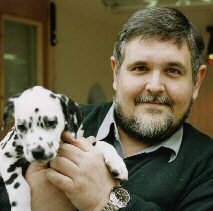 Very active in the field of companion animal welfare, he was the vet responsible for the animals in a number of films including '101 and 102 Dalmatians'. 1 What is your rabbit's main symptom?